You likely give your clients many reasons for eating healthier—weight loss, heart health, preventing or managing chronic illness. But how often do you emphasize the importance of maintaining a healthy diet for eye health? While clients may take the health of their eyes for granted when they are young, if they eat healthy today, they may be able to prevent problems down the road. Research shows that leafy greens are particularly beneficial for the eyes, as they are packed with the antioxidant carotenoids lutein and zeaxanthin. A study published in the Archives of Ophthalmology found that a high intake of these two carotenoids reduced the risk of cataracts by 18%. Foods rich in lutein and zeaxanthin include spinach, kale, turnip greens, collards, broccoli, pumpkin, and corn. Another egg-related study, published in the Journal of Nutrition, found that eating one egg per day can increase levels of both lutein and zeaxanthin in the bloodstream. Researchers found that lutein levels were increased by 26% and zeaxanthin levels by 38% during the weeks that study participants consumed one egg per day. The research team also made note that adding a daily egg to participants’ diets did not increase total, LDL, or HDL cholesterol or triglycerides—an important fact for those who are still wary of eating eggs. Vitamin C has also been shown to help keep eyes healthy by providing protection against the damage that UV light causes. Most of your clients are probably already aware that citrus fruits are packed with vitamin C, but many don’t realize that the vitamin also shows up in red bell peppers, strawberries, raspberries, broccoli, and Brussels sprouts. Vitamin E may also help prevent cataracts and even age-related macular degeneration. Some of the best sources of this vitamin are sunflower oil, peanut butter, wheat germ, and almonds. In general, maintaining a healthy weight is also important for protecting the eyes from disease, adds Dummert. “Research indicates that obesity and diabetes can both be linked to eye health,” she says. The American Diabetes Association reports that people with diabetes have a higher risk of blindness than those without the disease. While anyone is at risk for developing cataracts as they age, patients with diabetes are 60% more likely to develop the condition. In addition, people with diabetes are 40% more likely to develop glaucoma. If left untreated, glaucoma can lead to complete and permanent blindness. Many dietitians already suggest a Mediterranean-style diet to their clients for its proven heart-health benefits. But now studies have shown that adults who follow a Mediterranean-style diet high in omega-3 fatty acids also have a much lower risk of developing macular degeneration. Results from a study performed by researchers at the University of Sydney in Australia showed that people who ate one serving of fish per week had a 31% lower risk of early signs of age-related macular degeneration. In addition, those who ate one to two servings of nuts rich in omega-3 fatty acids had a 35% lower risk of developing the disease. Researchers believe that omega-3 fatty acids may have a protective effect on the eyes by preventing the buildup of plaque in the arteries or reducing inflammation in the retina. A second study, performed by researchers at the Centre for Eye Research Australia, found that people who ate higher levels of trans fats were more likely to develop late-stage age-related macular degeneration. Conversely, the study also found that those who ate the most omega-3 fatty acids were less likely to have the disease. While researchers already knew that trans fats can increase the risk of heart disease by increasing cholesterol levels, they now believe these fats may also have a similar effect on the eye’s blood vessels. 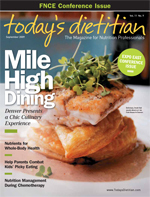 It’s yet another good reason to encourage your clients to cut trans fats from their diet.